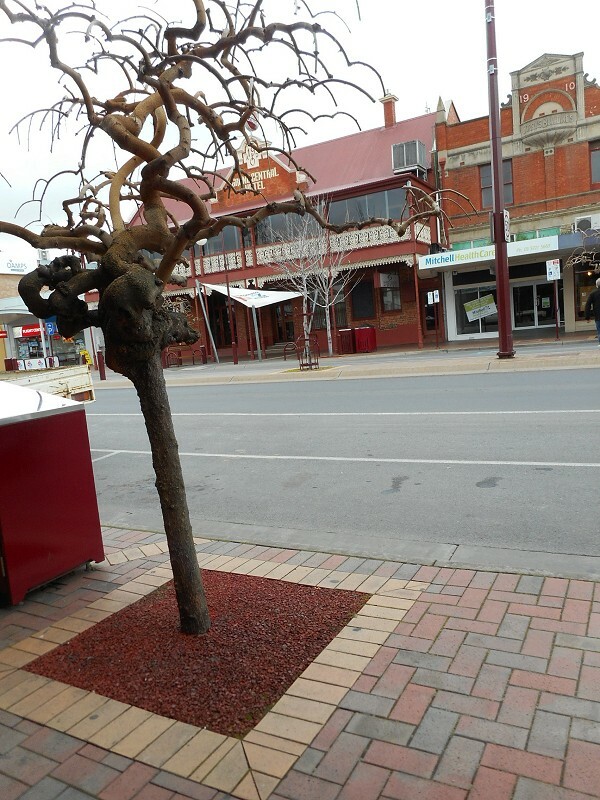 Random choice gives Wangaratta as the topic of the first photo post. It was also the first stop on my trip, and the last. Now to the photos, and I have split them into two posts. This one will be Murphy Street, some views of the streets and some of buildings along it, with notes from the heritage walk brochure the nice lady at the information centre gave me. The second post will be the other streets. 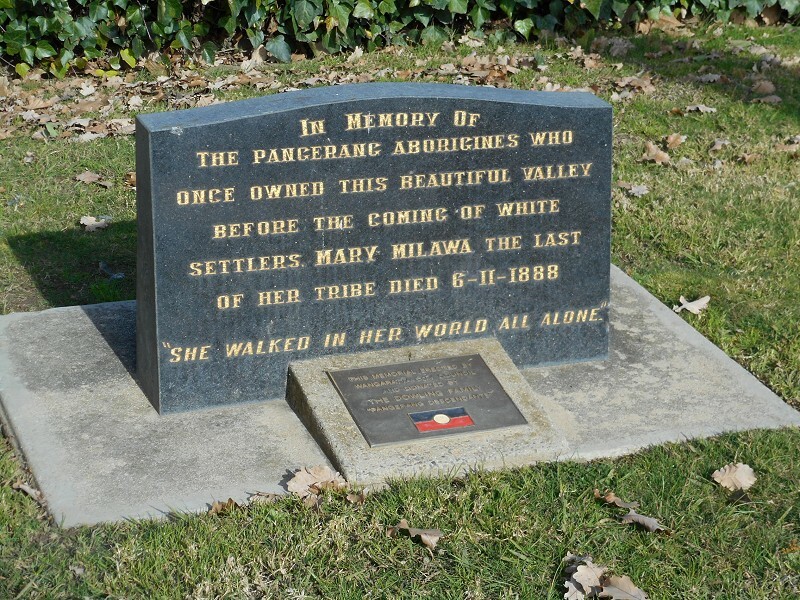 I'm using the Heritage Walk Wangaratta brochure produced by the Wangaratta Regional Tourism Board, and I'll put bits from that in italics. 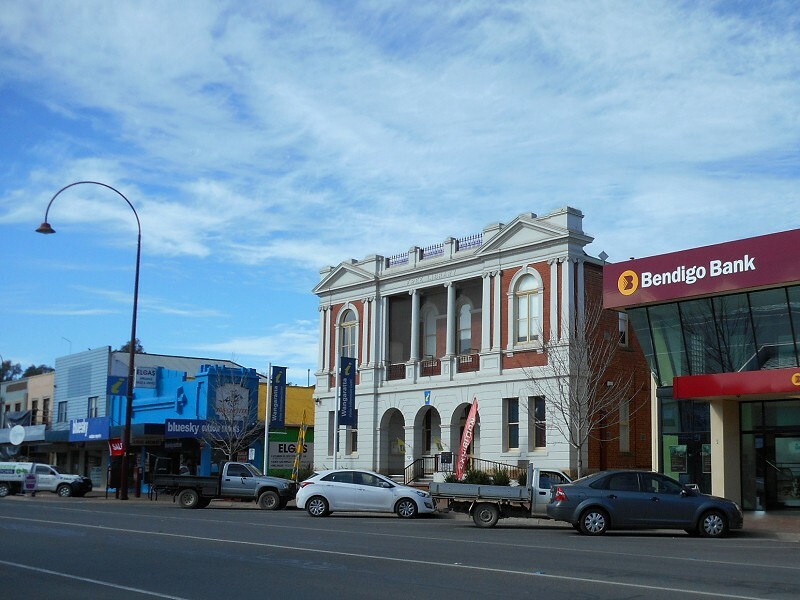 These first paragraphs are a slightly rearranged version of their "Snapshot of Wangaratta's History". Following Major Mitchell's favourable report of the area, overlanders were quickly on the move and settlement began in Ovens Crossing in 1838. 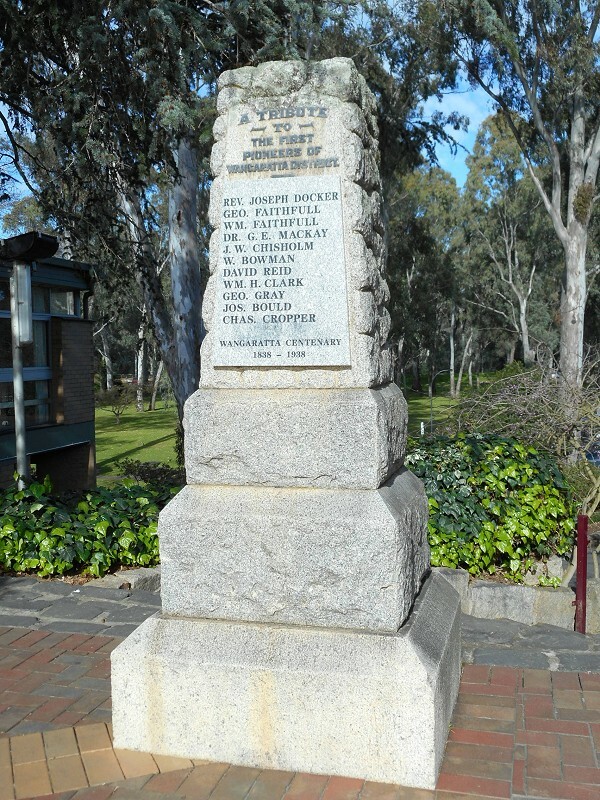 Thomas Rattray, our first settler, built a two-room slab and bark hut and primitive store near the site of the present Sydney Hotel. 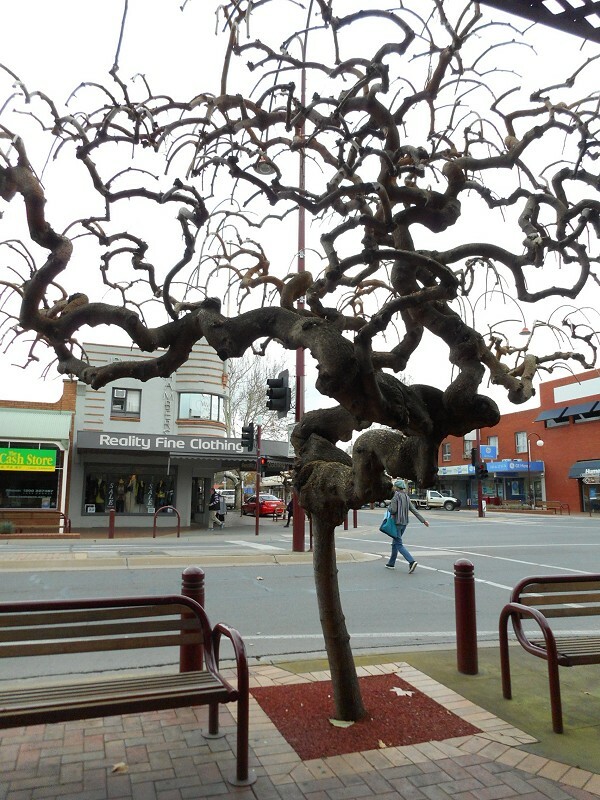 By 1848 the township had been officially named Wangaratta (an aboriginal word meaning either resting place of cormorants or meeting of the waters) and the population was approximately 200. During the next two years the first land sales were held, the first police were stationed here and the first police magistrate appointed. 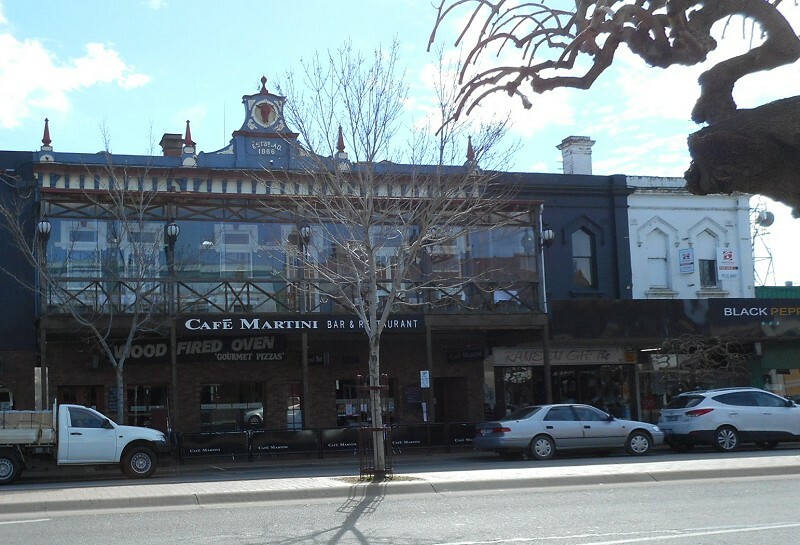 During the 1850s the gold rush brought thousands to the Ovens and Beechworth fields and business boomed in Wangaratta. 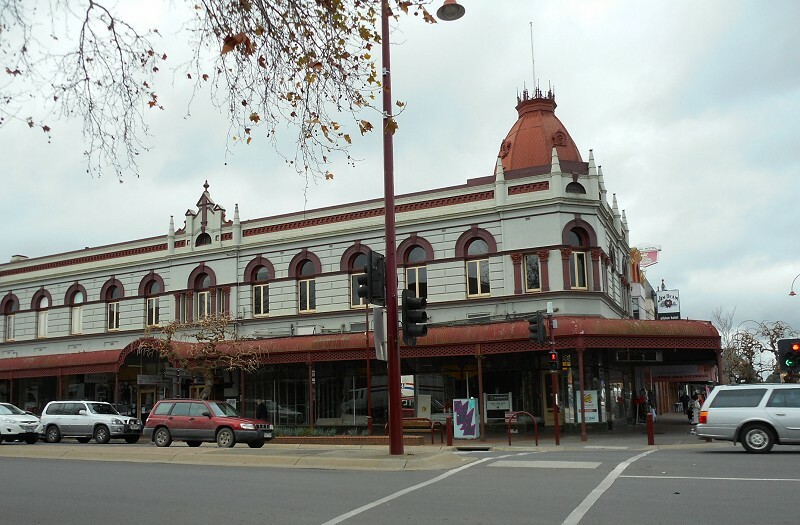 In the 1870s the public hospital was built, the Melbourne to Sydney rail line passed through Wangaratta, water mains were laid in several streets, the market yards were established and the first fire brigade was formed. 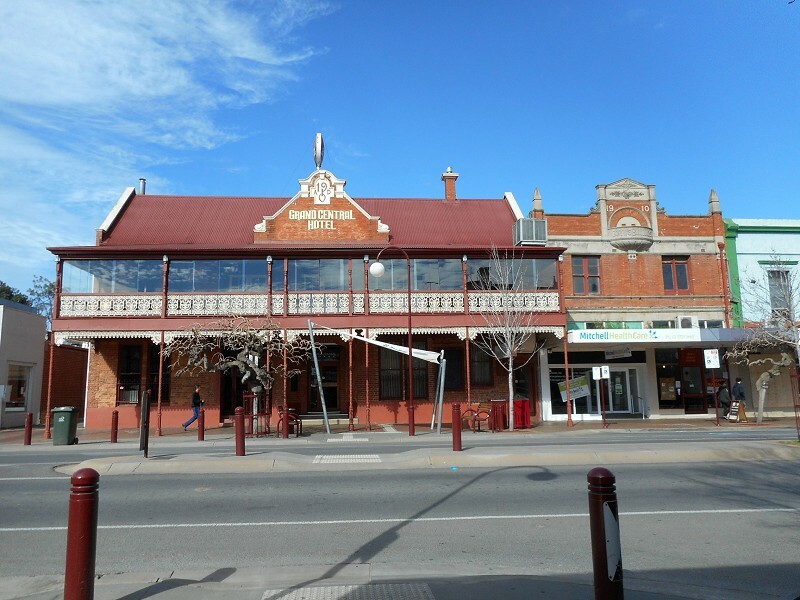 Bulls Head Hotel. Established 1866 it says up there, and there's a bull's head above it. At the turn of the century the population was two and a half thousand and there was a slow but steady growth till the end of WWII. The advent of Bruck Mills in 1947 accelerated the growth and at one time the mill had more than 1000 employees. 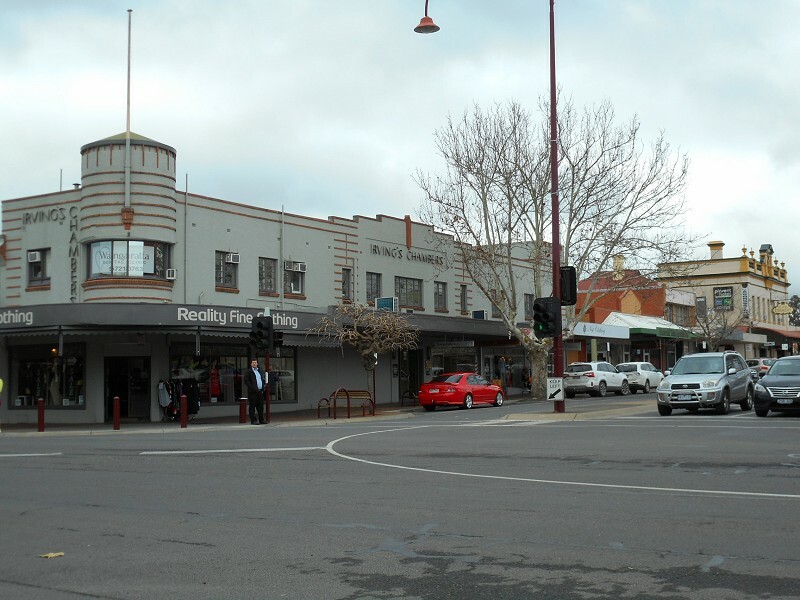 There's a little Art Deco-style building in middle of the photo from this time, and some others about the town. 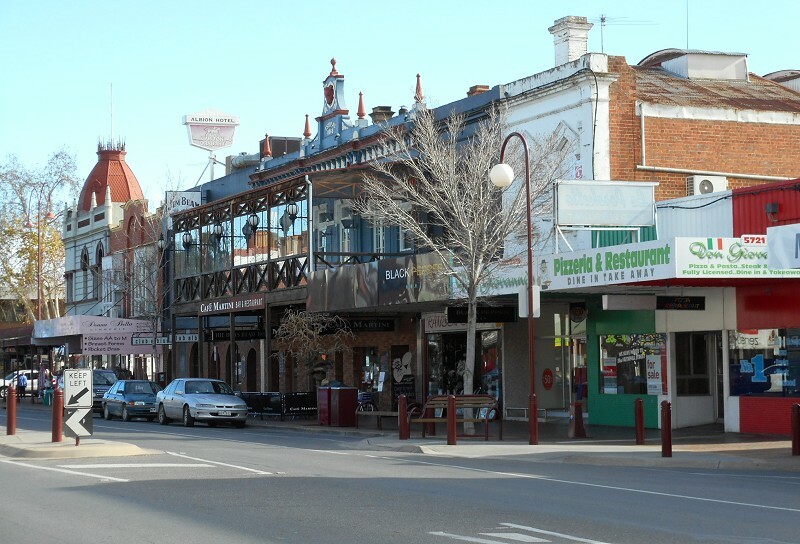 When Wangaratta attained city status in 1959, it had a population of 12,000. By the middle 1970s the population had reached 17000 and [in 1980] it was predicted that it would be about 40,000 by the end of the century. 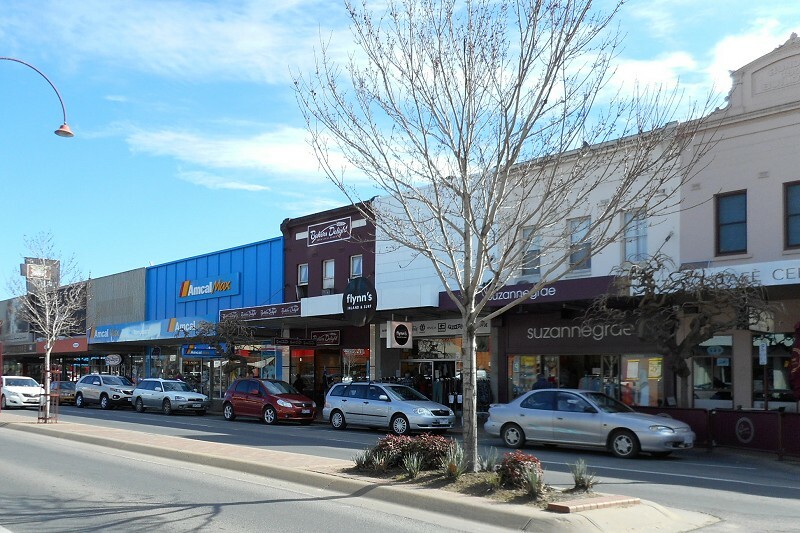 Such was not the case, and although the fusing of parst of six municipalities created the Rural City of Wangaratta in 1995 the population has remained fairly static for the past decade. Today it numbers 28,000. See, little Art Deo-style building. The first building that gets a mention in the heritage walk brochure. 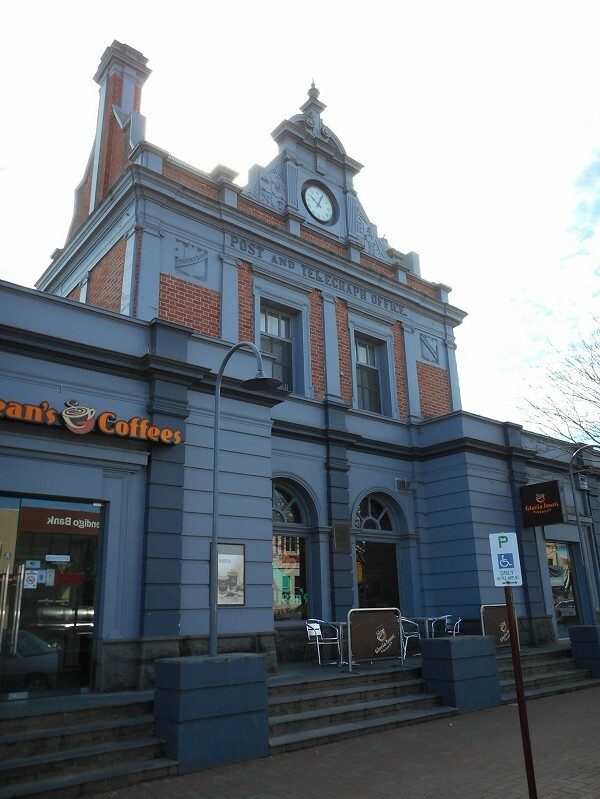 It says The Post Office was erected in stages in the 1870s and 1880s. 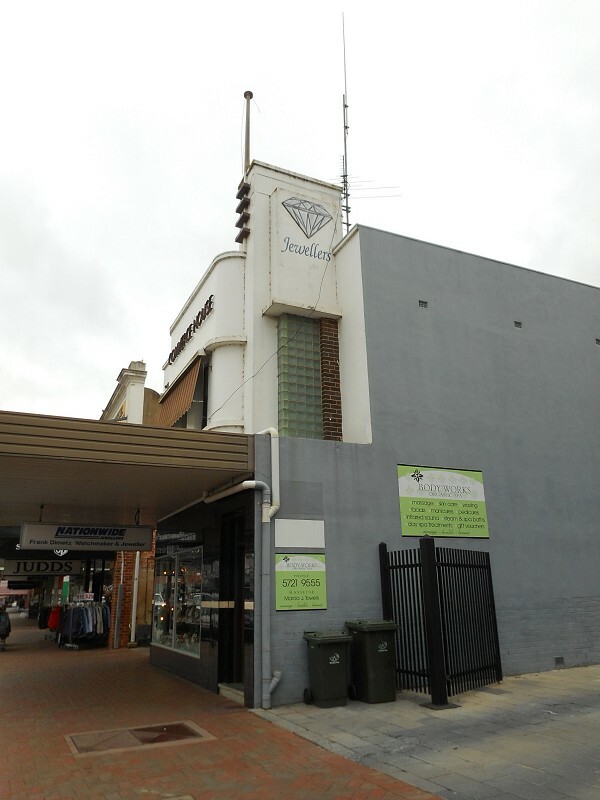 The telephone exchange was opened in 1904 with 33 subscribers. The building was recently painted Colonial Grey. Now to the other side of the road. Old Library: A building was first erected in 1858. It was demolished and the free Library was opened in 1909, it also contained a billiard room and a meeting room. 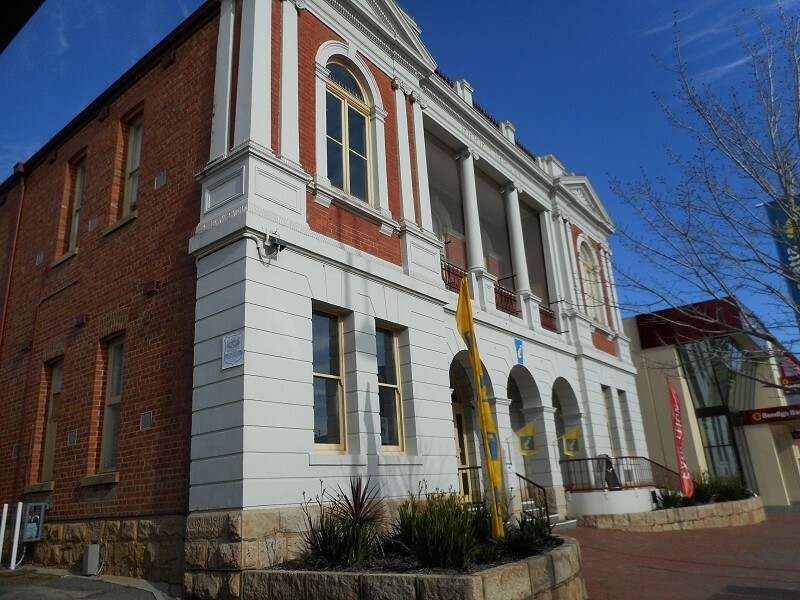 It is now the Wangaratta Visitor's Centre. And the sky really was that colour on Monday. 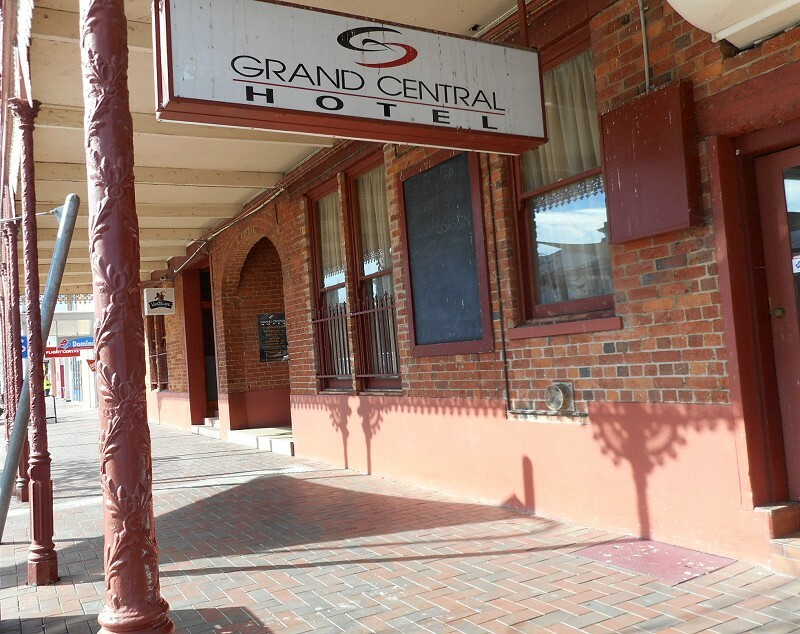 Grand Central Hotel, built 1910, it says at the top. I like this "Federation-era just a little bit showy" type of commercial building, although I don't see a lot of it. 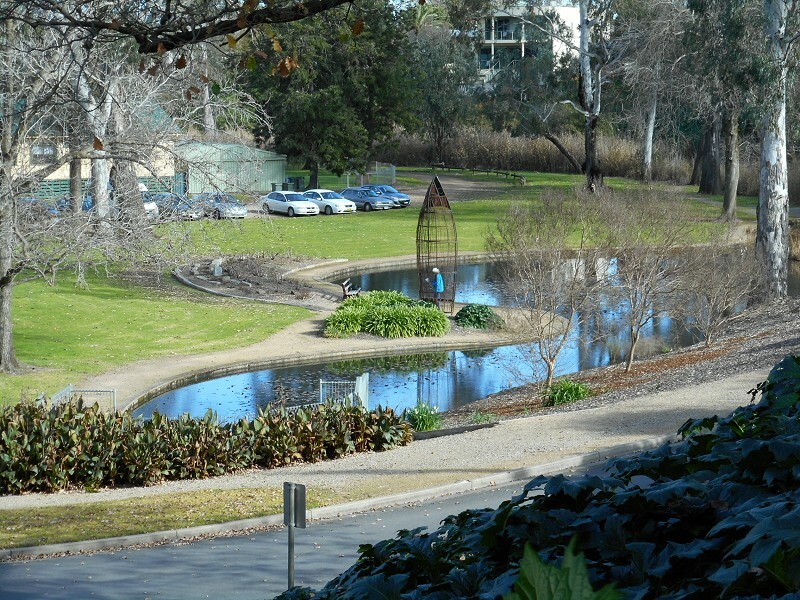 Merriwa Park: A sunken natural park, originally a meeting place of the Pangerang Aboriginal Tribe. 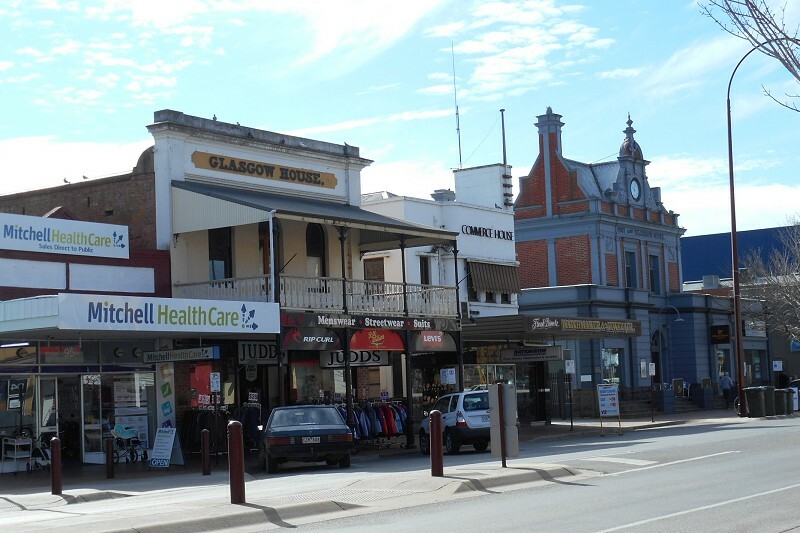 Merriwa means the rich flat ground at the bend of a river. There are two memorials along the road edge of the park. St Patricks Church. There was a funeral service on. They're just about to come out the door and there's a hearse off to the left of the photo. 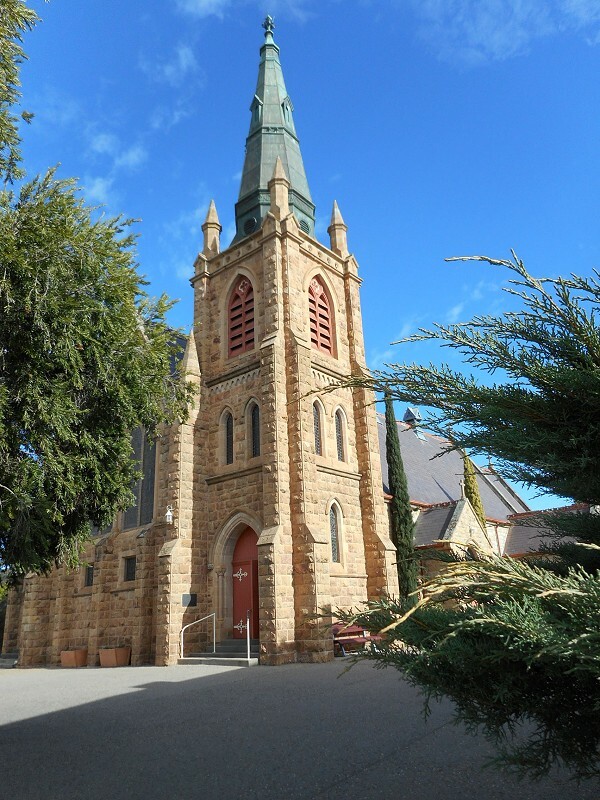 William Wardell, who designed the church, was also the designer of St Patrick's Cathedral in Melbourne and St Mary's Cathedral in Sydney.